In medieval times, strawberry plants were highly regarded. Their leaves were used for tea, their roots for medicine, and (obviously) their fruits were devoured. Due to their amazing powers, the ruby berries began to symbolize perfection and righteousness, leading stone masons to carve them into altars and pillars in cathedrals. 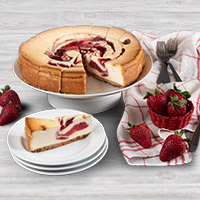 Though, perhaps, this particular symbolism is no longer associated with strawberries, we assure you that after trying this decadent dessert, you'll only think of these berries as perfection. 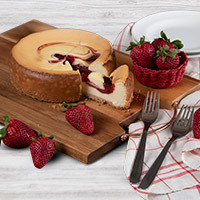 Ripe, red strawberries are hand swirled into the top of our smooth, creamy cheesecake creating a delicious dessert that's hard to find fault in.